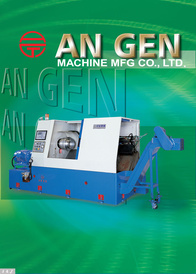 An Gen Machine Mfg. 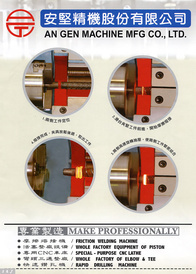 Co., Ltd. is a specialist manufacturer of industrial machinery, possesses 30 years experience in making multi-spindle drilling machine, elbow and tee processing machine and tapping machine, etc... All machines are specially designed for the specific purpose and are patents granted as well as quality warranty by the Economics Affairs Bureau of Taiwan. Major export markets include south-east Asia countries and Arabic countries. Persistency in products development and research together with up-to-date techniques can ensure you top quality products and excellent after-sales service.